The weather here in my part of Oz has been dry a long time now, months without rain, and it is apparent in that there are few creatures of any kind about, especially insects. Still there are some, here and there, hanging on in the face of great adversity – to them, being also under assault from incessant human activity. But there’s enough wild water to keep things going in the surrounding scrub bush and managed suburban gardens do help the little creatures survive another day, especially if there is accessible clean water – that they won’t fall into and drown. Late afternoon recently a rare bee flew into the house, to the cool darkness of the basement. It was trapped against a window for a while, trying to get out, so I caught it but it was too late to release it. I kept it in a huge jar and slid a sugar laced flower in with it and that way kept it healthy until daylight when it could fly away without the danger of the night. She didn’t seem to mind at all, this Domino Cuckoo bee – was probably attracted to my bee hotels for somewhere to lay her young. I’m glad I made some time to really enjoy one of your posts. It is very relaxing. I was planning on planting more bee and butterfly flowers in spring, my kids asked why. They’re impatient for an answer, but your photos convey my why, they’re cool. The thing about bee and butterfly flowers is so many more pollinators and their natural predators are also attracted, so you get to see a wide variety of creatures – if, as you say, you take the time to look. It is also an acknowledgment of the wonderful Earth, not a small thing at all. I think that’s why I love to do it, and when all the bugs and birds come, I’m sure they’re saying thank you. Yes, it’s not a small thing, it’s simple wonder. Thank you Mark for these good thoughts too. What a beautiful site. Thanks. Too little people don’t see the beauty in insects. I appreciate your eye to make them look like the incredible piece of the world they are. Wow, your photos are incredible. Thank you so much for sharing. Wow! How special is that!! Never seen one of these before in my own garden. Hope they’re around my way as well. Great pics as usual Mark, so clear and detailed. I just love it. Thanks Lissa. I don’t doubt they are around but finding them is not easy. I only came across two in four years and both flew into my place and were trapped against a window. 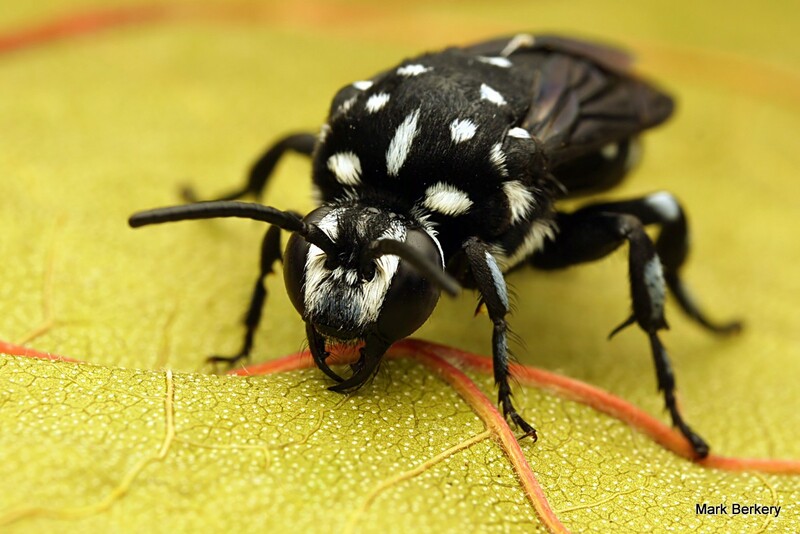 They are Cuckoo bees so they will be around where other bees nest, it’s where they lay. Looks very well with dots! 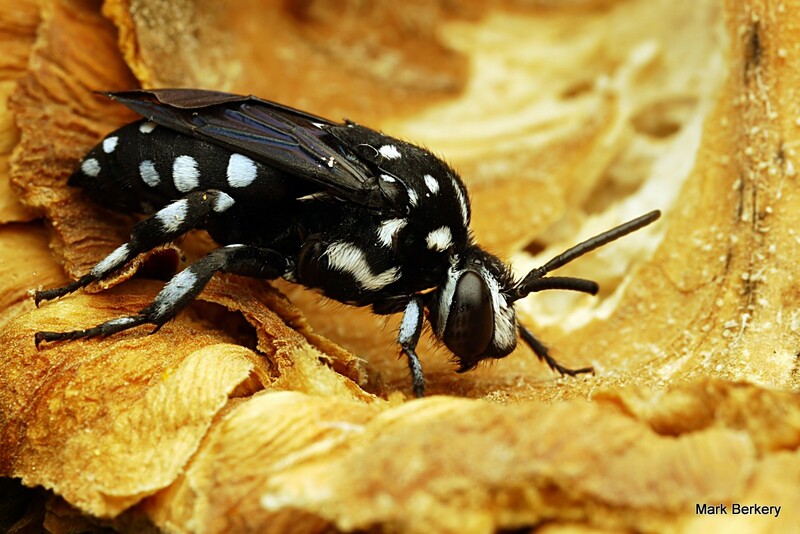 I’ve never seen a spotted bee! It is beautiful and the Macro is amazing. It is … thanks AFG. Nature has beautiful treasures, if one has a eye for it. The pictures are amazing. Yes, we only need to slow down to see – a most difficult task it seems. Me too … in my way. Very nice photos. I pinned and scooped (http://scoop.it/t/ecoscifi) them. This is a particularly attractive bee. It’s good to be reminded that the world if full of such things. Thanks, as always. WOW this is a very nice insect. It is, isn’t it … nature produces an infinite stream of form it seems. Hello Mark~ even in dry times it is amazing the beauty of the insects that pop in your garden for refuge and nourishment!!! And to see them through your lens is awesome!! Thank you! Hello Karen. It is amazing the nature that presents … anywhere. What a wonderful find and beautiful images, as always. I hope to encounter one of these bees some day. Thanks Deb. 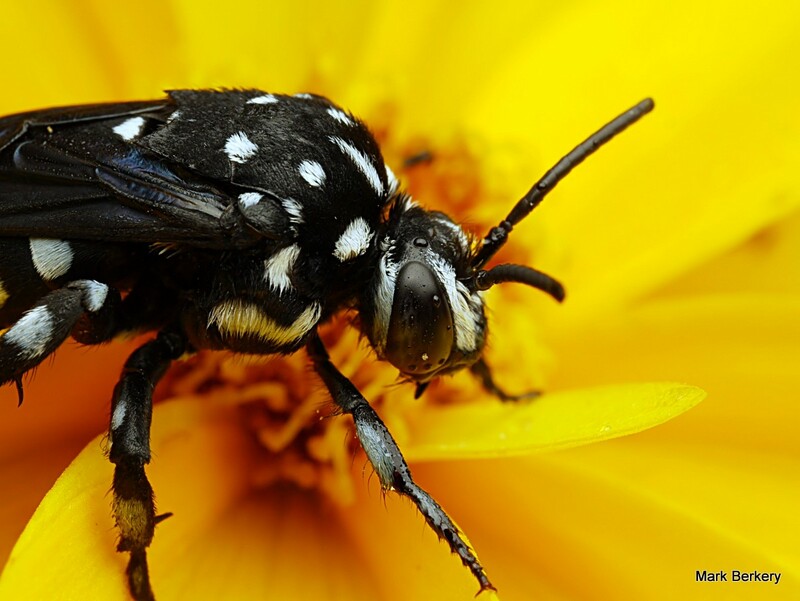 Wherever you find the other native bees the Cuckoo’s will show up, more easily seen at sundown.